As The Hive was faced with the challenge of developing a fresh and dynamic brand personality and a companion marketing program to encourage corporate sponsors to support the annual Road Hockey to Conquer Cancer (RHCC) fundraising event, they said, “Game On!” As part of their efforts to give back to the community, The Hive took on this pro bono assignment to challenge corporations to both sponsor the program and challenge employees and other stakeholders to take on cancer and support Road Hockey to Conquer Cancer, a rapidly-growing annual fundraising event (taking place Sept. 28 at Ontario Place) that benefits the Princess Margaret Cancer Foundation in Toronto. The key elements of the marketing program included brand-focused digital and print advertisements in the Globe & Mail and Hockey News, as well as a VIP corporate sponsor invitation pack that was hand-delivered to more than 300 executive-level corporate decision makers. The VIP direct mail package, which was at the core of driving new corporate sponsorship, featured an actual road hockey ball wedged in the centre of the delivery box, as though it had been fired with a slap shot. 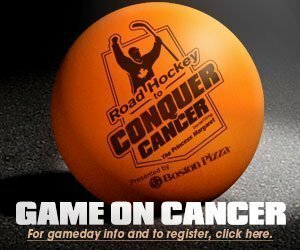 In addition to providing pro bono marketing and advertising support for Road Hockey to Conquer Cancer, for the third straight year The Hive will be fielding a team in the tournament, led by Creet and The Hive VP, Client Services Trent Fulton.